Abraham, Moses, Samuel and David were all Horite Hebrew as evidenced by the common marriage and ascendancy pattern of their fathers. Analysis of the marriage and ascendancy structure of their families reveals the distinctive pattern of the Horite Hebrew ruler-priest caste. 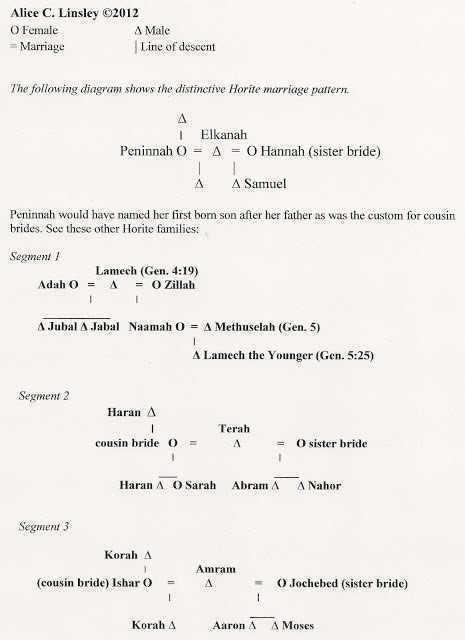 The pattern of Moses' family is identical to that of the Nilo-Saharan rulers listed in Genesis 4, 5, 10 and 11, and to that of Abraham's father Terah and Samuel's father Elkanah." David's father was a ruler-priest of the Horite Hebrew city of Bethlehem. It appears that all of these great men were Horites or Horim. Jews call their ancestors "Horim" which is Horite in English Bibles. Abraham ruled in Edom, the land of the Biblical Horites. Other Horite rulers are listed in Genesis 36, including Seir the Horite, from whom Aram, Moses's father is descended. At the time that Abraham lived there were no nations in the modern sense. There were peoples, clans, and castes. Ethnic identities aligned with the territorial chief. Jewish ethnicity, however, is figured through the Jewish mother. Abraham's ethnicity was Kushite and his father was a ruler-priest descendant of Nimrod, a son of Kush. Nimrod was a sent-away son who became a mighty ruler in the Tigris-Euphrates Valley. This is why we first meet Abraham in Ur, though his ancestors were cattle-herding Nilo-Saharans. Abraham was another sent-away son whose territory extended on a north-south axis between his two wives Sarah and Keturah. Sarah resided in Hebron and Keturah lived in Beersheba. Abraham also dug wells in Gerar to the west and had a treaty with the ruler of that region. Likely he also had water rights at Engedi to the east. This means that Abraham's territory was entirely in the region know as ancient Edom. 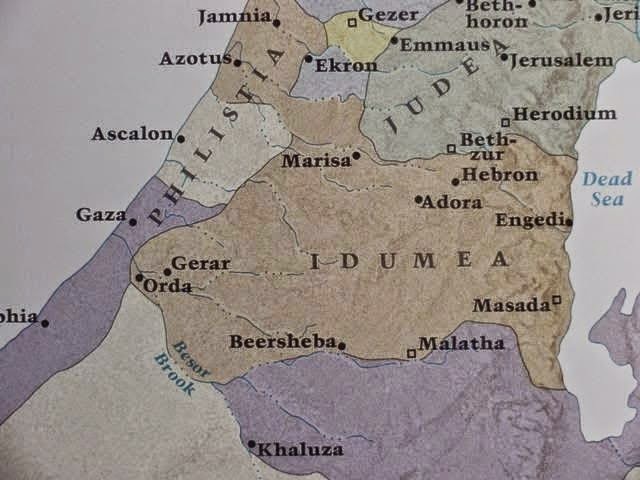 The Greeks called this region Idumea, meaning "land of red people." Edom is named in the Bible as one of the ancient seats of wisdom. The wisdom of the Horites extended to medicine, astronomy, writing, commerce, navigation, natural sciences, and architecture. The 400-acre Edomite complex at Petra reflects Horite beliefs. This was the home of the red Nabateans. Naba or Nabu was the guardian of scribes and prophets. The cult of Nabu was introduced into Mesopotamia and Babylon by the Kushites. Kushite kings sometimes bore the name Nabu, as with Nabu-shum-libur, an early Kushite king in Babylon and Nabu-aplu-iddina. This is the origin of the Hebrew word nabi, meaning prophet. The Horites were devotees of the Creator RA and his son Horus, born of Hathor who was divinely overshadowed. The Ra-Horus-Hathor narrative is a primitive form of the Gospel, or the Proto-Gospel about God the Father and the Son, and the miraculous conception of the Son of God by divine overshadowing. From Abraham's Horite people receive a long-standing tradition concerning the Son or "Seed" of God (Gen. 3:15). The Horites are the direct ancestors of Jesus Christ (Matthew 1:1-17), and understanding their way of life and religious beliefs helps us to understand who Jesus is. When someone asks about the ethnicity of a Biblical figure, they usually want to know about that person's appearance. The Bible tells us very little about the physical appearance of most Biblical persons. This is probably because people were less concerned about what we call "racial" distinctions. The genetic mix of the inhabitants of the ancient Afro-Asiatic world was extremely varied. 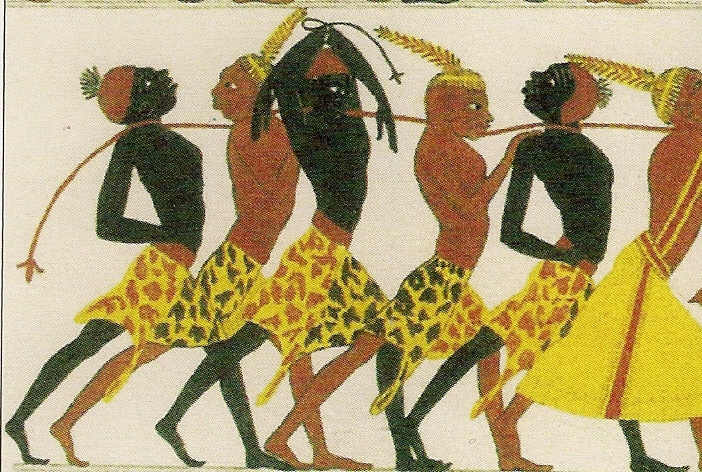 There were black and red Nubians. 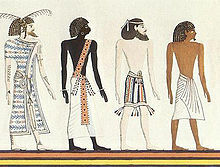 The Egyptians were reddish-brown, dark brown and black. The Edomites were lighter with dark wavy hair and a reddish skin tone. David is described as having a red skin tone, reflecting his connection to the Horite Hebrew of Edom (Genesis 36). The Ainu (Anu) were lighter with a reddish tone and some had green eyes. Ainu rulers wore beards. This Jewish writer, when asked if David was Jewish, defines Jewishness and then evades the question that must be answered. One is a Jew if his mother is Jewish or if he properly converts to Judaism. David was a Jew if his mother was, yet strangely the Bible is silent about David's mother. According to the Talmud her name was Nitzevet. The reason we find scant information about David's mother is because she wasn't a Jew. Judaism had not yet emerged as a separate religion. David's mother was a blood relative of Jesse (Yishai). She was either his half-sister or his patrilineal cousin. Likewise, Abraham was a Jew if his mother was, yet the Bible describes Abraham as a Hebrew because Judaism did not yet exist. Again, the biblical texts tell us little about Abraham's mother. This is intriguing, given that the Jews are fastidious about genealogical records. We have reason to suspect that this information was withheld or deleted at a time after Abraham and David, probably by the Deuteronomist Historian who places great emphasis on Jewish racial purity. Analysis of the marriage and ascendancy pattern of the Horite Hebrew (shown above) reveals that Abraham's mother was the daughter of a great ruler named Nahor. This is Nahor the Elder. Nahor the Younger is Abraham's older brother who ruled Terah's territory after Terah's death. Abraham was a sent-away son to whom God delivered a kingdom in Edom. The Horite Hebrew were a caste of ruler-priests who practiced endogamy. The Genesis text explains that Abraham and Sarah had the same father, but different mothers. Sarah was Abraham's half-sister. Keturah was his patrilineal cousin bride. The Bible does not explicitly state the ethnicity of the mothers of Abraham and David. However, analysis of the genealogical data clarifies that they were both ancestors of Jesus Christ. Their people lived in expectation of the appearing of the Son of God, according to the promise that was made to their ancestors in Eden (Gen. 3:15). This points to the core family around which the tradition and expectation of the Son of God developed. Research on their identity makes it fairly certain that both women were of the Horite ruler-priest caste. Horite priests married the chaste daughters of Horite Hebrew priests who maintained shrines along rivers or at wells. This is why so many of the leading figures of the Bible meet their wives at wells. The Horite priests have been traced back to the oldest know Horite shrine at Neken in the Nile valley. The Hebrew root for Horite or Horim is hr, and this is also a proper name. Hur was Moses' brother-in-law. Moses' family was also Horite, as evidenced by his father's marriage and ascendancy pattern. The name takes many forms including Hur, Haran, Harun (Aaron), Horomo, and Harwa. The Edomite rulers were Horites and the Edomite shrine city of Petra reflects Horite beliefs. Kushite wives are found among the Horite Hebrew clans and many of the greatest figures of Biblical history married Kushite brides. Abraham and Moses did. Moses' first bride was his Kushite half-sister. Zipporah was his second wife and his patrilineal cousin. David was born about 1040 B.C. He was the eighth and youngest son of Jesse (Yishai). Jesse also held the title Nahash (2 Sam. 17:25). Nahash is linked etymologically to the word “snake” and to an Akkadian word meaning “magnificence.” Jesse was a Horite Hebrew shepherd-priest, as was Mary's father Joachim. Sacrificing priests kept sheep. Jesse had a wife in Bethlehem, David's mother. The settlement of Bethlehem was originally known for the sacrifice of sheep and rams. The meat was distributed to the poor, which is why the settlement was originally called "House of Meat." This meaning is retained in the Arabic name for the town: bayt lahm. Jesse had at least twelve sons, probably by two wives. The ruler-priests of Abraham's people maintained their two wives in separate households on a north-south axis. This is what is revealed by analysis of the kinship pattern of Genesis 4-5 and Genesis 11. I Chronicles 2:13-16 lists David’s siblings, but does not mention that some of these children may be the offspring of Jesse by two wives. If Jesse followed the residency pattern of his ancestors, one wife resided in Bethlehem and the other resided in a Horite Hebrew settle to the north or south of Bethlehem. Probably David's mother was in Bethlehem and the other wife was probably in Hebron. This would explain why David was anointed first in Bethlehem and later anointed as king of Judah in Hebron (II Samuel 2:1-4). We note also that before being anointed as the ruler, David had married two wives following the custom of his ruler-priest ancestors. This parallels Isaac's story, in which Abraham must find his son a second wife (Rebecca) before he dies so that Isaac may become the ruler over his territory. Rebecca was Isaac's cousin bride. Isaac's half-sister bride would have been living in Beersheba, which is where the servant brings Rebecca to wed Isaac. David's first two wives are likely a half-sister and a patrilineal cousin. Ahinoam of Jezreel would have been his cousin bride, as Jezreel is just north of Hebron. Abigail of Carmel was probably his half-sister bride, as Carmel is south of Hebron. She is probably the Abigail named as David's sister in I chronicles 2:16. She had married Nabal who refused to help David when he needed provisions for his men. • Someone who is matrilineally descended from a proper convert. The first is the only definition that can be applied to Abraham and David since both men lived before the Babylonian Captivity which marks the beginning of Jewish identity, and among their people ethnicity was traced through the mothers. This being the case, the critical question is what was the ethnic identity of David's mother? According to the Talmud (tractate Bava Batra 91a), David's mother was a daughter of Adael. Adael is the masculine equivalent of the name Adah. Adah was the wife of Lamech the Elder, and the mother of Jubal and Jabal (Genesis 4). This is also the name of one of Esau the Elder’s wives. So Adah and Adael is a family name traced back to the lines of Cain and Seth (which intermarried). Both versions of the name are traceable to the Kenites, the descendants of Cain who intermarried with Seth's line. So David is kin to the Kenites. This explains why David sent the spoils of war to the cities of Judah and to the Kenites (1 Samuel 30:29). We are familiar of the story of Jael, the wife of Heber the Kenite, who killed Sissera by driving a tent peg through his temple while he slept (Judges 4:21). Here we find a connection between the Kenites and the Hebrews. Heber means friend in Hebrew. The title was given to Abraham, the friend of God. David's ancestry is traced through the following women: Tamar, the daughter of a priest. Tamar, the Righteous, tricked Judah into impregnating her. When Judah discovered that she was pregnant, he ordered that she be burned to death. This was the sentence for daughters of priests who committed adultery or harlotry. The Horite Hebrew, sometimes known as Khar/Korah, were ruler-priests who married chaste daughters of priests who ruled over shrines and temples at high elevations near permanent water sources. Rahab of Jericho was the wife of Salmon the Horite, the Son of Hur (Hor). Salmon is called the "father of Bethlehem" in 1 Chronicles 2:54. Rahab became the grandmother of Boaz who married Ruth. Salmon (also Salma or Solomon) is a Horite name and is associated with Bethlehem (1 Chronicles 2:51). The evidence concerning David's ethnicity points to Kenites and Horites who intermarried. In the ancient world shrines were places of rituals. Common rituals included baptisms or water cleansing; circumcision, and the removing of front teeth called nak or naak. Kar-nak means place of performing the removal of teeth, a practice found among the ancient Nilotes. Abraham’s mother is not named in the Bible, but according to tradition she was the daughter of a priest associated with the Horite shrine of Karnach in ancient Nubia (Upper Nile). This is evident from the name of her father, called "Karnevo" in the Babylonian Talmud. Karnevo would have been a Horite Hebrew since the shrine of Karnach was dedicated to Horus, son of the Creator. Another theory is that Abraham's maternal grandfather was the high priest of the shrine at Kar (mountain fortification) Nevo (Nebo). I find this theory the most compelling.